GT Omega Pro ▷ Size & Buying Guide on GOTURBACK.UK! The GT Omega Pro is a pretty good chair, its design is simple, but it has features found in more highly priced chairs. It does, however, have its negative points, which is expected with chairs at this price. The GT Omega Pro is well built and does have a more premium feel than most chairs in this price range. The chair has clearly been constructed with comfort in mind, this is evident in the shape of it and the materials used. The Omega Pro would fit nicely into most environments, whether it be a games room or office. It is simply a great value chair. The Omega Pro is a good quality chair it is built around a steel frame, with a synthetic covering. The chair does not come fully assembled but is easy to construct in around 10 minutes by the user. With cold-moulded foam providing cushioning, the chair is comfortable, giving support to the body. In addition, the chair comes with a lumbar cushion, and a neck cushion. However, the lumbar cushion can be restrictive and can force you to sit forward, which although this is good for your spine, some gamers might not enjoy sitting in this way. The Omega Pro includes 4D armrests which are often found in more expensive models. The base is made of aluminium which is also often more associated with higher-end chairs. There are negatives with the Omega Pro however, for example, the weight limit is at the lower end at 120KG, other gaming chairs currently available often have weight limits of up to 200KG. It also doesn’t include any leg rest or the option to add a leg rest, which some gamers do rely on. As with most gaming chairs, the Omega Pro has a class 4 gas lift system. Furthermore, it does tilt and the tilt is lockable. The casters are made from nylon and PU which are good for reducing damage to floors but not as heavy duty as coated metal casters. It is a good chair for those that want an adjustable chair without a huge price tag. Heavier gamers should be aware of the weight limit, however, and ensure that the dimensions of the chair are right for them. Overall, the chair has the basic functions that most gamers require but doesn’t have as many customisable options as more expensive models. The chair may also not be suitable for users that are on the taller side. You can purchase the Omega Pro in a number of different colour options. It comes in black with red stitching, which is great for those wanting a more subtle design. It is also available in orange and black, black and blue, white and black, and red and black. 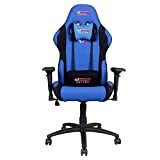 These colours should fit well into most gaming rooms, the colour and pattern options aren’t as glamorous as most gaming chairs which some may prefer. The neck and lumbar support cushions are included with the chair and can be removed if necessary, as some gamers can find these slightly annoying. The Omega Pro should be suitable for most people of average size and weight. The maximum weight limit is 120KG which is slightly on the lower end. Taller gamers may struggle with this chair as it is recommended for users of up to 6ft 2 inches. For most people, this should be okay, but if you exceed this height, you may find that the Omega Pro isn’t the most suitable chair for you. The width of the main seat is 39cm and the widest part of the backrest is 60cm. Have you seen my size guide yet? Give it a try, if you need some help!